When we introduced the Process last year, it was an immediate hit. 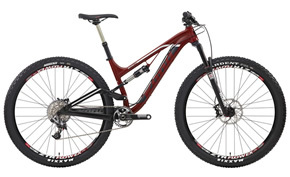 Bike Magazine called it “a genre-defining bike.” The all-new 2014 Process features our new Rocker Independent Suspension, which serves up a deep-dish progressive feel but keeps the bike high for optimum pedal efficiency. The new linkage incorporates large bearings, while the frame geometry features a low BB, using the shortest possible chainstays for a nimble, responsive ride. This is our do-it-all and affordable no-holds-barred Enduro bike. With a great component package that features Shimano brakes, a Type 2 rear derailleur, tubeless compatible WTB 27.5-inch rims and a RockShox Pike 160mm fork, the Process 153 does not skimp.